You can get from Bucharest to Sighişoara on E60 (DN1 until Braşov – 160km, then DN13 to Sighişoara – another 115km). The road is quite perfect, with the exception of the Ploieşti Ring and some parts of Prahova Valley. From Braşov to Râşnov and Bran you have to use DN73 (E574), which is in a pretty bad state. Alternative route from Bucharest: Ploieşti – Predeal – Pârâul Rece – Râşnov on DN1 and DN73A. Be advised, DN73A will soon be repaired. The work is set to take 2 months, although some say it can’t be finished in less than 1 year. Unfortunately, you can’t get to Bran or Râşnov by train. However, you can make the Bucureşti – Braşov – Sighişoara trip by train and then rent a car. There are many villas and hotels in all the cities. The prices (especially in the Bran-Moeciu area) are a little higher than in other parts of the country. My advice would be to choose Braşov for the night, as it is in the middle of our target area, but any other town will work just fine, as you won’t have to drive more than 200 km. 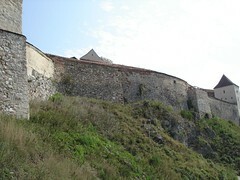 The city of Braşov began building its fortress in 1395. Each guild built it’s own tower and in times of war, it was responsible for protecting that tower and the surrounding area. Braşov was, for a long time, the most powerful city in Transylvania. Today, only a few towers and parts of the wall remain, like the White tower and the Black Tower. There are also numerous old inns and churches. The Black Church is the biggest Gothic cathedral east of Vienna and perhaps the best known tourist attraction in the city. You can find the 38m high church next to Tâmpa, the mountain overlooking the city. It’s known as black from 1689, when it was damaged in a big fire. Sighişoara is THE fortified town. Home to the Medieval Festival (in the last weekend of July), the city has gained an enormous popularity both in Romania and abroad. The old (fortified) part of Sighişoara is actually made up of two parts: the Upper Town and the Lower Town. The Clock Tower (currently Sighişoara’s history museum) is the biggest of all the towers of the former fortress. The view from upstairs is impressive. There is a fee if you want to use your camera in the museum, but it doesn’t apply to the upper balcony. Tickets cost 5 RON for adults and 2.5 for students. 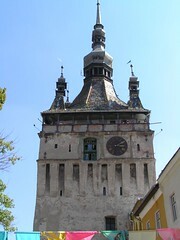 There are about 10 smaller towers dating from the 13th to the 17th century. Other museums (there is a common ticket for all of them): The Torture Chamber (where you can see various torture instruments from the Middle Age) and The Weapons Collection. A remarkable construction, the biggest of its kind in Transylvania is the “Covered Staircase” which gives easier access to the High School and “The Church from the Hill”, especially on winter days. Today, only 175 steps remain. The ocher-colored house named “Casa Vlad Dracula”, where the Vlad the Impaler was born, is now a cozy restaurant. You can find inside Gothic-style furniture and serve good soups and traditional Romanian dishes. In the Upper Town, you can admire the church with it’s beautiful statues and cemetery. 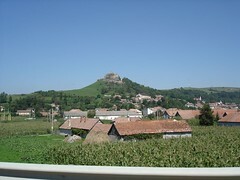 The Citadel in Râşnov is special because it was built by peasants on a hill next to the village. It had houses for every family, as well as a church and a school. This way, the peasants could live there for a long time in case of a war. It was recently restored by an Italian investor, but has now returned to the Local Council’s ownership. The entry fee is 10 lei. In the museum, you can see some interesting things discovered in the fortress, from old weapons and torture instruments to old coins. If you’re lucky, you can have a free tour from one of the supervisors. He will tell you much more about the place than you need to know 🙂 Outside, there are some preserved homes, but unfortunately none has the interior restored. There are lots of legends about the place. One of them states that the fountain was built by two Turkish prisoners in the 17th century. They were promised freedom if they finished the fountain, but were nevertheless killed after 17 years of hard work. Actually, the digging of the fountain (134 m deep) was decided in 1625, after the fortress was forced to surrender to Gabriel Batory in 1612 due to the lack of water. It was finished in 1640 and abandoned in 1850. The Bran castle is so well known for it’s link to Dracula that it doesn’t need an introduction. 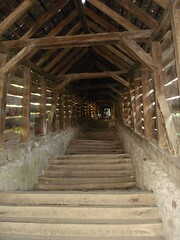 It was built as a customs point for the area by the town of Braşov in the 14th century. In the 20th century, it was owned by the Romanian royal family. During this period it was restored and modified to fit the taste of Queen Maria by the architect Karel Liman. Besides the Castle, you can also visit the Customs House and the Village Museum, both in the castle’s courtyard. If you have the time, you might want to visit the Feldioara Fortress (21 km north of Braşov on the E60), Făgăraş Fortress (70 km east of Braşov on the E58), the Haller Castle in Horghiz (50 km north of Braşov on the E60) or the Racoş Castle (10 km south of Horghiz).